The Funeral Service for Mrs Carolyn Rose of Willagee will take place in our Chapel, 312 South Street, Hilton commencing at 2:00pm TUESDAY (9.04.2019). 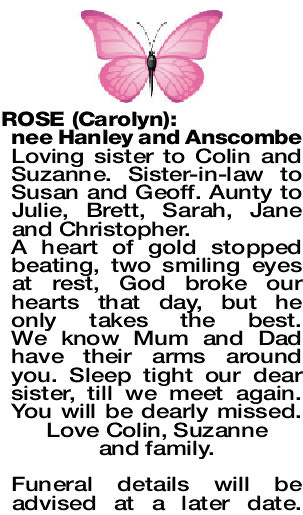 Loving sister to Colin and Suzanne. Sister-in-law to Susan and Geoff. 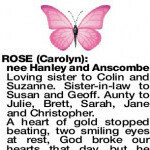 Aunty to Julie, Brett, Sarah, Jane and Christopher. A heart of gold stopped beating, two smiling eyes at rest, God broke our hearts that day, but he only takes the best. We know Mum and Dad have their arms around you. Sleep tight our dear sister, till we meet again. You will be dearly missed. Love Colin, Suzanne and family. 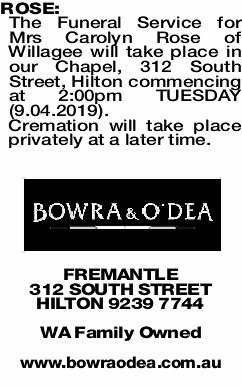 Funeral details will be advised at a later date. 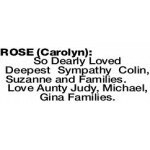 ROSE CAROLYN So Dearly Loved Deepest Sympathy Colin, Suzanne and Families. Love Aunty Judy, Michael, Gina Families.